Combine oil, garlic, 1/3 cup lemon juice, capers, dill and lemon thyme in a large jug. Season with sea salt and pepper. Place salmon, in a single layer, in a large ceramic dish. Pour over half the marinade. 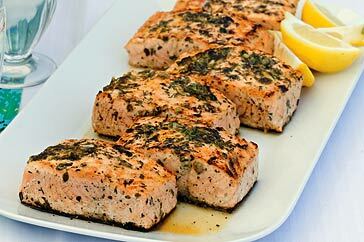 Turn salmon over and pour over remaining marinade. Cover. Refrigerate for 2 to 4 hours to marinate. Remove from fridge 30 minutes before cooking. Preheat a greased barbecue plate on medium-high heat. Barbecue salmon, skin side up, for 3 minutes. Turn and barbecue, brushing occasionally with marinade, for 4 to 6 minutes (depending on thickness) or until just cooked through. Serve with lemon wedges. Tip: You can replace the salmon with ocean trout. Compare the prices - often one is cheaper than the other. Which Is Better: Black Tea or Green Tea?